Family members of Tamir, including his Mother and cousin, gathered with the community on Saturday, November 22, 2015 at the Cudell Recreation Center, where Tamir Rice was shot by police Officer Timothy Loehmann one year ago. Concerned members of the community met to honor Tamir’s life and to demand accountability from Officer Loehmann. A group of young children, surrounded by stuffed animals and small presents for Tamir’s memorial, faced members of the community who released 12 doves into the sky, one for each year of Tamir’s life. During this time, attendees observed a moment of silence. Everyone in attendance extended their deepest sympathies to Samaria Rice, Tamir’s mother, on the 1-year anniversary of her child’s death. The message of the vigil was clear: stop killing our children. On Sunday, November 23, 2015, members of the community marched to Prosecutor McGinty’s office in a peaceful demonstration to deliver 200,000 signatures, with names from all over the country, in a petition organized by Color of Change, Change.org, and Showing Up for Racial Justice. The petition calls for McGinty to step down and to be replaced by a special prosecutor. A group of young children, surrounded by stuffed animals and small presents for Tamir’s memorial, faced the audience while members of the community released 12 doves into the sky, one for each year of Tamir’s life. The peaceful demonstrations were widely attended and received ample media attention, largely due to the successful organizing efforts led by community activists and the Rice family in the weeks prior to the #YearWithoutTamir. In preparation for the weekend, activists organized and attended legal training sessions to educate each other on their legal rights to demonstrate and to develop skills for maintaining safety at demonstrations. The community also created banners, signs and other art to display at the vigil, and organized a town hall with other mothers whose children had been shot by police. The local chapter of Showing Up for Racial Justice (SURJ) organized a day of canvassing and phone banking, reaching out to local Cleveland residents, inviting them to join their community at the vigil. SURJ also asked members of the community to call Prosecutor McGinty’s office on behalf of Tamir’s mother, to respectfully communicate the communities’ wishes for justice for Tamir. The Rice family requested that members of the community honor the pain and heartbreak of losing Tamir by participating in the weekends’ activities in a peaceful manner. Everyone who participated in the #YearWithoutTamir weekend respectfully honored this request. If you live in Cleveland and are interested in becoming involved, please contact the local Showing Up for Racial Justice chapter. 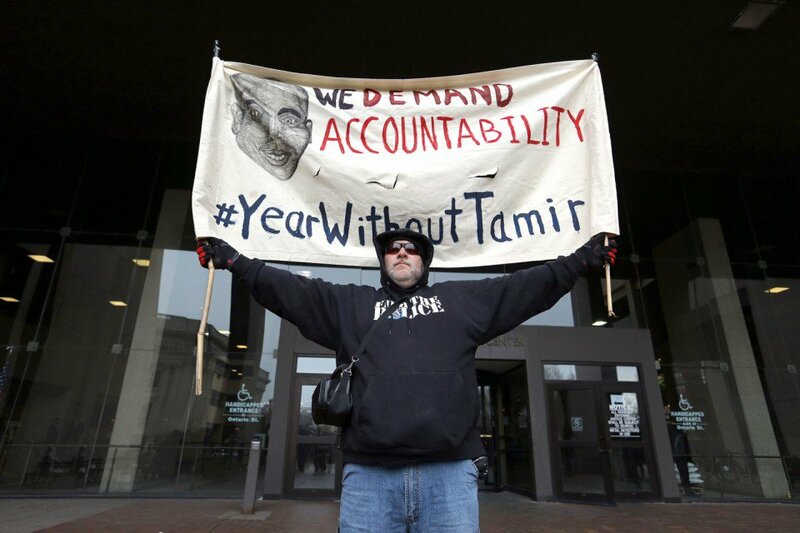 In addition to the #YearWithoutTamir events that were hosted in Cleveland, there were over 40 cities nationwide that held similar events to show their support and call for justice in the Grand Jury investigation. San Francisco, Portland, Ferguson, New York, Cincinnati, and many other cities held vigils, marches, and demonstrations in honor of Tamir Rice and all victims of unjust police practices. These actions are part of a larger movement gaining momentum across the country, drawing attention to the disproportionate levels of police violence targeting communities of color. The organizing efforts here in Cleveland brought together a wide range of diverse, compassionate people, some of whom have been standing with each other for a year, demanding justice for a 12 year old boy who lost his life too soon.